Whether it’s climbing Everest, rowing the Atlantic, or cycling around the world, we seem to have a fascination about the equipment chosen to get the job done. Maybe it’s the die-hard devotion to a brand and the fear of unfamiliarity, a passion for technology or the latest innovation, or an engrained bad experience of rubbish kit letting us down badly. But why put kit through trial and error when somebody else can do it for you? Surviving a 5000-mile journey in 72 days should be a pretty good test. So, for anyone heading off on their own adventure challenge, the gear-junkies, or the simply curious: here’s a list of everything I took on Climb The UK. 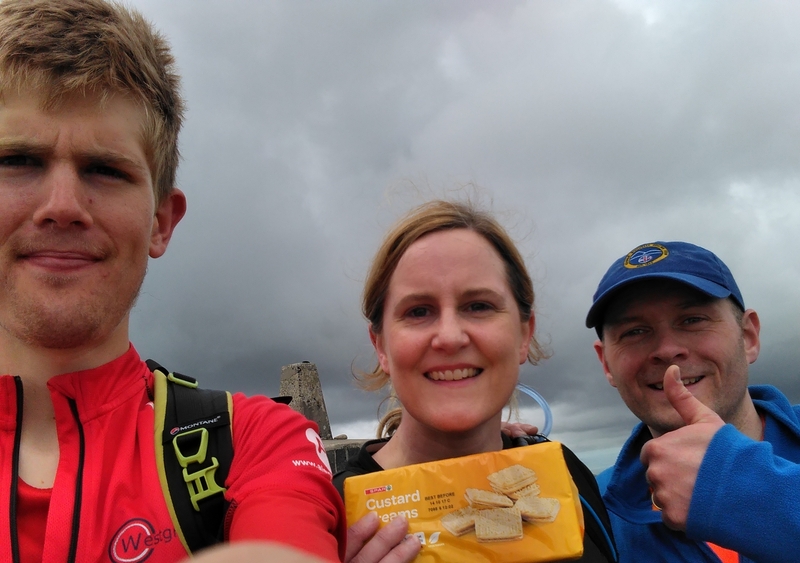 The challenge was predominantly cycling (up to 122 miles/day) but with walking/trail running (up to 22 miles/day) and even a dash of kayaking. Sure, it was hardly fierce Arctic blizzards or bush-whacking the Amazon but near enough everything you could experience in a British ‘summer’. With the variety of conditions you have to throw out most of the creature comforts and compromise for middle ground otherwise you’ll take your entire wardrobe. I’ve never been too fussed about saving a few milligrams or having the latest fancy gizmo but for a challenge this big you need reliable kit without making life any harder. So much comes down to personal preference but the opinions below are from honest experience only. Although I am grateful to be sponsored by various brands I will only endorse kit that I like – not just because it was free/discounted. Please feel free to contact me or comment below if you want more detailed feedback; I’d be happy to help. I’m not going to pretend I understand mechanics or what I’m talking about with bikes: I just ride them and hope for the best. Fixing broken chains is about the limit of my repertoire. Genesis Tour De Fer 10 2017 touring bike, including pannier rack – at 14.18kg this was heavier than anything I had ridden so took some getting used to. But what a machine! The steel alloy was very comfortable to ride and sturdy enough to withstand the British pothole paradise. The bike was the only thing that I couldn’t break. 2 x Altura panniers – waterproof except the one with a hole in from a previous crash. Just about big enough with careful packing. Schwalbe Marathon tyres 700 x 35c – not a single flat tyre! They could handle the odd gravel track but I tried to stick to roads, mostly dictated by the saddle sore. 2 x one litre water bottles. The SIS bottles leaked like a sieve until I smelled of tropical fruit, but two new Zefal bottles were fine. Usually two was enough for a few hours before re-filling. If I had some monster climbs before reaching a refuel I would pour water out to save weight. Luckily my dad is a much better mechanic and serviced the bike about half-way in, which undoubtedly prevented any breakdowns. I tried to clean my chain and drivetrain when possible but rarely had the energy so things wore out more quickly. Regardless, everything except the chain was in great condition. Pump – would have liked a pressure gauge to check the tyres, for when you’re convinced something is slowing you down and want to blame something else. Spare foldable tyre – controversial extra weight but if a tyre goes, you’re pretty much buggered. Small bottle dry chain lube – if you ask nicely at hostels they usually have unwanted towels, or you can buy cloth wipes at convenience stores. 3 x cable ties – they fix anything! Rubber bands – they always come in handy somewhere. Everything except the foldable tyre was stored in my under-seat bag or in a little nylon tool bag. Most of my admin and tweets were done whilst walking up hills, then I’d run down to save time or get out of bad weather. Some of the routes were literally reached by bike or were just a half mile off the road, where it was often quicker to walk up in my cycling shoes! Hostels have great washing facilities but due to time/energy this was usually only once a week. Going over 30 days without a shower in the Himalayas conditions you well for a primal existence. Inov-8 Roclites 295 – trail running shoes were a much lighter option to walking boots and gave the option of running in. Enough grip for gnarly Scottish rock and slippy mud but with more cushioning for walking in. Many would tut at the lack of ankle support but as a runner I prefer minimalist footwear. I find them more proprioceptive to the terrain and thus actually prevent going over on my ankles. Super comfy – escaped without a single blister! Giro SPD Privateer shoes – pretty robust and comfortable. Having the raised lugs underneath meant I could walk around in them quite comfortably and often didn’t bother changing shoes for the road-accessible tops. The drying room at SYHA Glencoe is so hot I managed to melt the inner sole on one! Endura cycling jersey – typical cycling top with a nice ½ zip to adjust to temperature. 3 elasticated rear pockets to store my phone and snacks. Paramo long sleeve base layer – usually wore this under my jersey but after Scotland it was usually too warm. Amazing wicking and anti-bacterial material so took a while before it began to smell. Marmot Vars Fleece – lightweight hoody that has lasted me for four Himalayan expeditions. Keeps quite a bit of warmth even when wet. I rarely wore this but was a nice back-up to have for peace of mind. Marmot Pre-Cip Full Zip waterproof pants – very easy to put on with the full zip. In heavy rain and wind they took the chill away. Unfortunately as I quickly lost weight they were too big on the waist so I left them at Glasgow youth hostel… hang on, I still need to collect them! Marmot Scree walking trousers – didn’t wear these on the hills as they would restrict my running movement and get covered in mud, but useful in the evenings to prevent upsetting folk with my shorts. As I lost weight I had to improvise a belt from the draw-cord on my drybag. Berghaus short-sleeve base layer top – branded with logos and stuff, used as my ‘evening’ wear whilst the other stuff was usually drying out on radiators. Berghaus Xtrem Light Waterproof Jacket – incredibly lightweight but better suited to walking than cycling as it was quite baggy. DHB waterproof hi-vis jacket – specifically used for the cycling and as a ‘spare’ waterproof. Tried to wear this on every major road or busy area. Nice tight fit and convenient chest pocket for storing my phone for easy access to check routes etc. Only downside was the lack of a hood (rain went straight down the back of my neck) and breathability on the uphills. 1 pair Inov-8 merino ankle socks and 1 pair hi-vis ankle socks. Whilst one was muddy I usually had the luxury of a spare pair whilst drying the others, but having wet socks was the norm. Tighter fit made them hard to get on but a small price to pay for no blisters. Marmot beanie hat – added insulation. Large-ish drybag – storing the above clothes, and kept inside my rucksack ready to go for the foot sections. Separate heavy duty plastic bags for ‘evening clothes’ and shoes too. Marmot Powerstretch Gloves – trying to open a combination lock with numb fingers and your teeth isn’t much fun. Terra Nova Comp one man tent – fantastic kit. Long and tall enough for me to sit upright (I’m 6ft 4”) yet only 900g! Very easy and quick to pitch. Thanks to Fraser for kindly letting me borrow it. Camping without a mat was usually fine on soft grass, except one particular campsite which was like sleeping on a wooden desk. I spent 11 nights under canvas but was always glad to see a youth hostel. Marmot Atom sleeping bag – nice large hood, packs down small, and plenty warm enoug despite being just 600g… like sleeping in a bag of sugar. Awesome. Montane 32l rucksack – kept inside my panniers. It has a simple and lightweight design, with pockets for my water bottles on the outside. More water resistance would have been nice and the top pocket is too flimsy. Luckily I did Ben Nevis on a weekend as someone noticed my wallet falling out of it before I did. Petzl Myo RXP headtorch – used this on Cho Oyu in -20 degrees so it was definitely tough enough for the job. CAT S60 smartphone – my sidekick! Used this for all communication, logistics, navigation and social media. The camera was good enough to capture pretty much the entire journey and send my compact camera home. Being waterproof I could have it in my hand during the worst downpours without worrying about the phone kicking the bucket. The battery life was superb and seemed unaffected by cold weather. Sometimes I switched off mobile data to conserve battery on my longer days without stops (hence the tracker was sometimes slow to update) but it usually got through a full day whilst doing everything. Casio Pro Trek Smartwatch – to be honest I didn’t get chance to experiment with the features but used it mostly for Viewranger navigation – you can download a route via Bluetooth within seconds and it mirrors what happens on the phone, which is hugely useful for saving time and phone battery. You just tap the watch instead of having to open the phone app. Unfortunately no matter how good the watch is, I was still usually late. Heart-rate monitor chest strap – I liked to get an accurate idea of intensity and calorie burn by heart rate. You don’t really notice it’s there but sometimes gives faulty readings. Garmin Edge 810 XT – used for cycling navigation, mounted on my handlebars. Portable battery pack – my first broke, so I ended up with an EE power stick (thanks Robin) which was tiny but enough to give the phone a boost if I couldn’t stop somewhere. Sony Xperia XA smart phone – back-up and MP3 player. All of my Viewranger routes were mirrored on this. 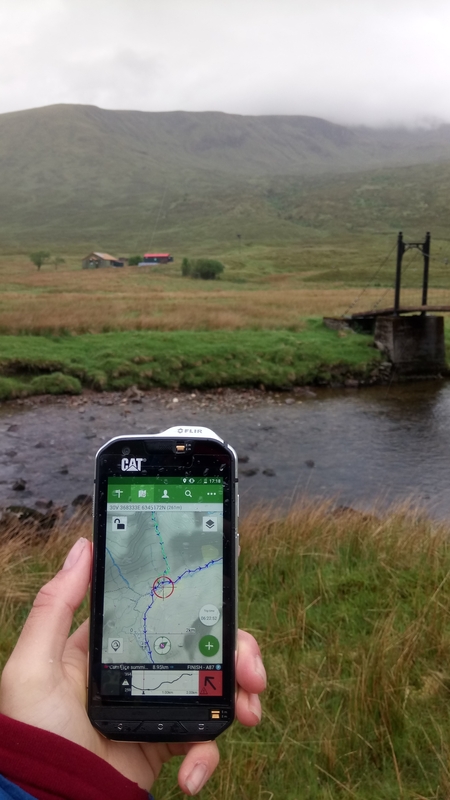 The downside was I didn’t have a spare SIM card and very nearly dropped mine in long grass on Kinder Scout when transferring it from the CAT phone. Sports headphones – I love music to pass the time although this was a luxury for the longer walks. Rock music is the staple, trance helps speed the pace up, whilst Runrig, The Proclaimers and Biffy Clyro were saved for emergencies of belting out alone in Scottish glens where nobody could hear. Various chargers in a protective case – with the shortest possible leads, and a double wall plug adapter to charge two devices in one was super useful. Tube of Endura Chamois cream – needed more half-way through. Suncream 30SPF – smallest bottle possible. I got burnt in Scotland. Yes, sunburn in Scotland! Toothbrush – cut in half. And toothpaste. Smidge midge repellent – you’ll be more grateful for this than anything. They were ravenous in Galloway and Northumberland. Shower gel – usually pinched those tiny bottles from B&B’s which would last a week or so. Many of the hostels sold it too but many of my showers were soap-less. Ibuprofen and paracetamol, plus Night Nurse tablets when I got my chest infection. A couple of plasters – they didn’t stick well but the red fleece worked well as a bandage too. Shaving razors – I had these sent out within my food parcels. This backfired in Belfast youth hostel where I managed to cut my chin and spent half an hour with a towel pressed into my face to stop the bleeding. Clear plastic zip bags – great for saving weight. Berocca tablets to prevent illness and kinesiology tape for the medial quad muscle injury. Mini dry-bag – spare phone and wallet inside. Saves rooting around in a large bag. Thanks Rich for lending me his. Sunglasses bag – handy for keeping Garmin and devices in, to prevent them getting scratched in my rucksack. Carrier bags – for storing everything from dirty clothes to food. To keep this blog of digestible size I will need to write a separate post on this alone. My nutrition plan was totally inadequate considering I lost about 6kg and I have lots to learn. But for now I will just mention what I always carried with me. Water – probably went through a minimum of 3 litres per day, up to 7 or 8 during heatwaves. Flavoured and sparkling water is usually more palatable than plain water if you struggle to drink enough. 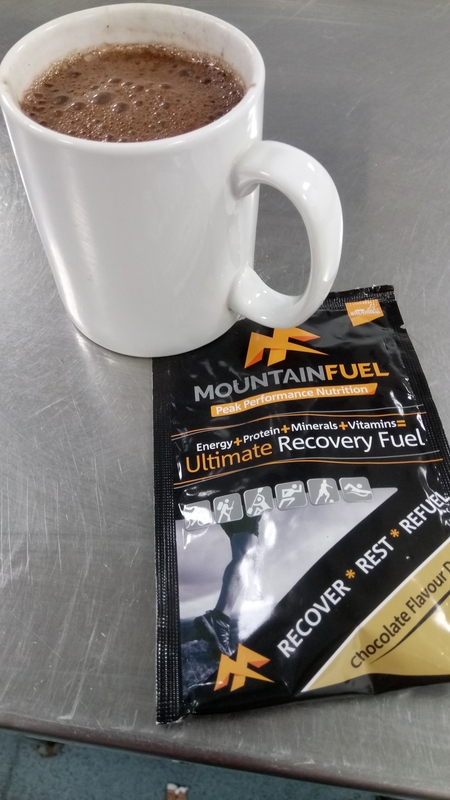 Mountain Fuel – I used Xtreme Energy Fuel during the daytime, but only really needed one or two for the harder days. One powder sachet (blackcurrant or tropical) makes 750ml and it’s full of electrolytes, so was especially good in the hot weather or when needing a power boost at the end of longer days. The ‘Morning Fuel’ sachets are like porridge or a shake, dependent on how much water you add. When camping it was a tasty kick-starter to get me to my nearest coffee. The ‘Recovery Fuel’ sachets were my favourite and probably most useful, considering the mostly low intensity. It’s a chocolate milkshake powder to mix with either water or milk. It made a nice treat at the end of each day when microwaved in a mug like hot chocolate. Tastes lush but full of good stuff to aid recovery. Litelok bike lock – a new innovation supposedly more secure than a D-lock and lighter too. Being wider it can fit around more things like lamp-posts. I still have my bike so I guess it worked well, at least until the key jammed on my penultimate day, luckily without the bike locked into it. Small lightweight combination lock – kept this handy in the seat bag and used this most of the time when quickly nipping into shops or public toilets. On foot I usually carried the most valuable items like the tent, electronics, and anything that couldn’t be easily replaced I.e. cycling shoes. It was all dependent on location. In the middle of nowhere I took just my rucksack, wallet, some easily digestible food and water. These were usually the longest routes where I’d rather take the risk to save weight. Fortunately the county tops in urban areas were generally so insignificant you can either cycle straight to them. If near a hostel/campsite I would stash kit there first. Bring a paper back up. Addresses, check-in times, contact numbers, ferry tickets, timetables and useful stuff was printed and stored in a plastic wallet just in case my phone died/went missing. I also had details foreach of the highest points. Some weren’t obvious and I couldn’t risk falling short by assuming anything if my maps failed. Café’s are usually more than happy to re-fill water bottles for you which saves paying £2.00 for a 500ml bottle. Especially if you shop at Booths. Bring some business cards. I always kept some handy for giving to the people I met along the way, so they could follow my progress and donate on my website (which many did). Record the journey on a dictaphone. Writing blogs is a chore when tired so I recorded my daily thoughts into a Voice Recorder mobile app whilst walking up hills to save time (as I usually fell asleep whilst doing them in bed). It captures the intricacies that help when it comes to writing the book. Carrying a tent is a good emergency back-up if you fall short. In some areas there may be no accommodation for miles but you’re never far from a field or forest in a worst-case scenario. Have some text printed on the back of your gear about your challenge is a good idea… unless you don’t want people to ask about it and join you for a few miles. Relentless forward momentum. Whatever goes wrong, there is ALWAYS a solution. Just keep on going. And going. Please support young people facing their own daily mountains with mental illness. I have a question for you…….How many packs of Custard Creams did you get through?